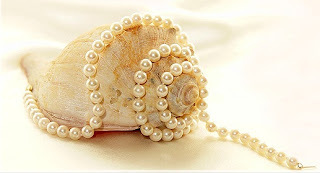 Freshwater pearls are the gems that have always and will forever be in style. All the latest trends and fashionista’s around the world incorporate them into every day wear. They are simply the easiest to work with because they not only complete all the outfits that seem nearly impossible, they also can be the beginning of a new family tradition. Thousands of women pass down their gems to younger generations, where pearls are the main gem that is passed down. As for pearl anklets those are unique. You may not see them as much, but they are sure out there. I know that everyone that has one loves them because they complete the outfit without being overbearing and pompous. Unlike bracelets, anklets are perfect for the summer; bracelets get in the way and are sometimes too much for an almost perfect outfit. They are subtle enough but give enough spice to an outfit that tops everything off. oh yes! it has a classic quality that lends elegance and class..
by the way, do you mind checking THIS out?